About 3:57 local time (1:57 UT) of August 30th 2016, SMART Project's detectors have registered a bright fireball over Málaga (South Spain) skies. This event could be recorded with the fireball detection stations operated by the SMART Project located at Calar Alto, La Sagra, La Hita, Huelva and Sevilla observatories. Two of the Calar Alto Observatory surveillance webcams (south and west ones) could also register the object. 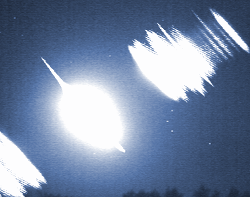 The analysis carried out by the SMART Project's PI, José María Madiedo (University of Huelva), points that this fireball was generated due to the impact against our atmosphere of a cometary type meteoroid, starting a about 97 km above the Mediterranean Sea level in front of the coast of Málaga. The luminous phenomena finished at an altitude of about 38 km above the ground. 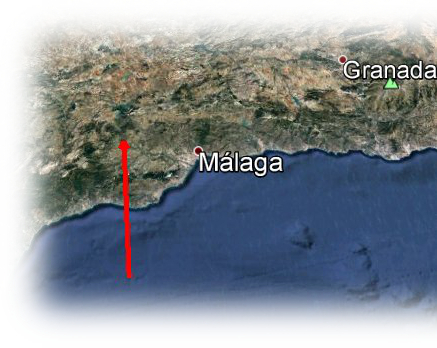 The image above shows the path over the ground this object followed, starting above Mediterranean Sea and finising over Málaga province. On the left picture, the bright lines that can be seen by the fireball are the object' s emission spectrum. Below are the three videos recorded at Calar Alto Observatory, with the fireball detection station and with the two surveillance webcams (south and west ones).